This is one-stop shopping if you can't wait to get out on the golf course. This Senior set has everything you will need, except for golf balls and tees. I'm not a big fan of these full-set deals, although they will save you some money as opposed to buying irons, drivers, and your putter all separately. The set is designed for people with slower swing speeds, and all the clubs are very forgiving. The eighteen-piece set comes with six irons. The irons are oversized and have a cavity back. You also get three hybrids, a 3, 4 and 5. The woods are a square 3 wood and a huge 460cc square driver. I'm not a big fan of this set. 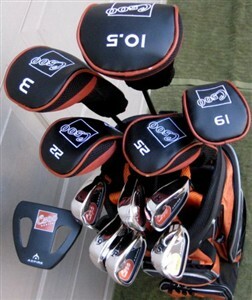 If you must get a complete set, check out the Adams Golf A3OS 13-Piece Senior Integrated Iron Set. I like this set much better. It is made by Adams -- the market leader in hybrids -- and the quality of the equipment is better. Finally, I'd still recommend you buy a putter and some wedges separately as well.